Of all of the strategies I've used with the kids I've taught, close reading has been the most effective at helping my students with reading comprehension. Why is that? 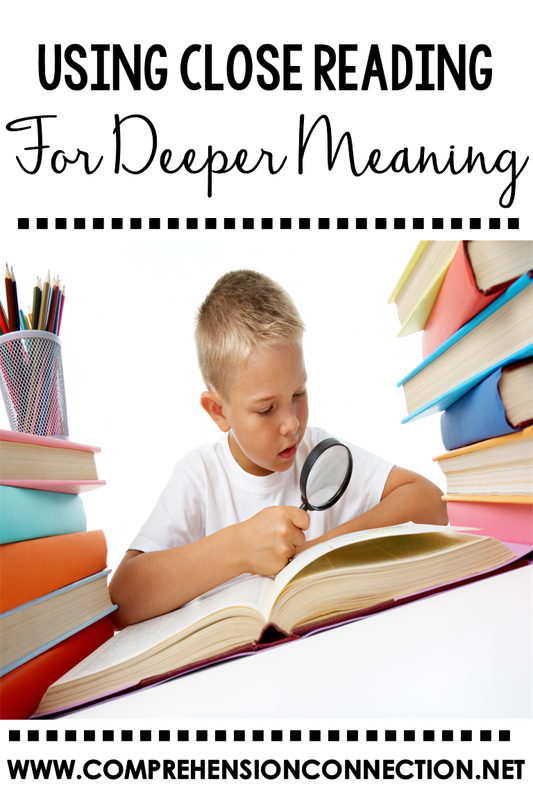 Well, I believe it teaches children to not just read the words and get surface level understandings, but rather, it requires engagement and high level thinking. 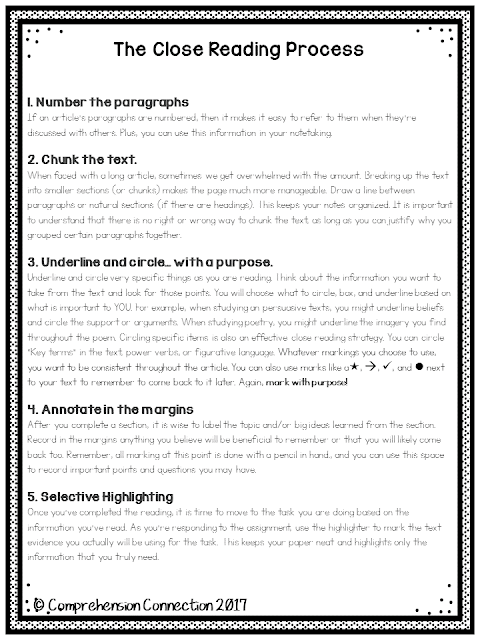 Today, I'd like to revisit the close reading process with hopes that these tips might provide support as many approach end of year assessments. Close reading is not moving your paper closer to your eyes (one of the kids suggested this today). 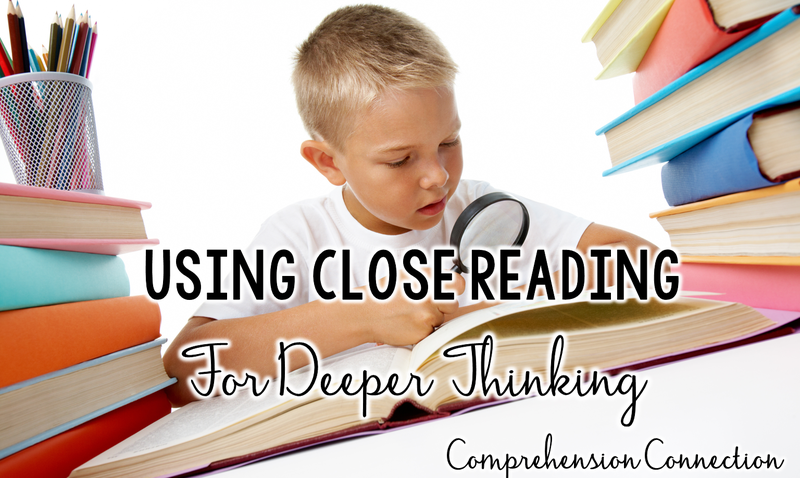 Close reading is not rereading alone. Close reading is active engagement with the text demonstrated by annotations that highlight important points. For successful use of close reading, the teacher should model with think aloud to model how to analyze the importance of information AS we read. Thinking aloud is very important and should be used with read alouds, articles, and even with anchor charts we use. This is especially imporant as we scaffold the instruction for your struggling readers (or when you first share it with your students for the first time). Gradually, you want them to take over the responsibility and independently do it. Read through different lenses in order to select specific information. According to Chris, Close Reading is "making careful observations" of something and then "developing interpretations from those observations". In other words, we stop to look carefully at choices an author (or painter or musician or director or architect) has made, and then develop ideas from what we have noticed (stop and jot). This means students read with different lenses to match the purpose we give them and observe text evidence to fit that designated purpose. Look for connections with the text and analyze the author's craft. We want our readers to be strategic in their reading and thinking. We want them to observe the author's use of language to convey meaning and apply that learning in their own work. I tell my students all the time that reading and writing go hand-in-hand. When I share a read aloud with my kids to introduce a new writing assignment or to model a reading skill, I'm not simply reading the book. We are ANALYZING the author's craft to apply it to our own writing ideas or using that text to practice the skill. The best way to become a strong reader or writer is to interact with strong writing that is filled with vivid vocabulary, includes varied sentence length and type, that's well organized, and that shares a strong message or idea. As we break down the text, we are thinking, and test taking is all about thinking strategies. Read sections of text to see how small ideas connect to the bigger picture. As students work with the close reading strategy, their level of understanding improves. With the first reading, I see my students navigate through the decoding process with some of the vocabulary, get the gist of the reading, and observe basic information with a pencil in hand to mark it. They scratch the surface. With the second and third visits to the text, we hone in on specific skills, record annotations in the margins of the evidence that proves our thinking and that match the assigned purpose, and share our learning and opinions with one another. It is through group discussions that we quickly see the depths of understanding our students have achieved. Will your kids reread on your state assessment? They may not reread a piece three times, but if we can slow them down by getting them to annotate, I think your odds increase. Choose a variety of texts including songs, poems, articles, ads, and even books. Close Reading is a strategy that can be used with all sorts of text types, so don't confine it's practicality to just short fiction and nonfiction stories. It works well with video clips, song lyrics, poetry, television ads, and movies. Students in upper elementary through high school have a need to talk and crave controversy. Chris gives examples of how we as teachers can capitalize on that energy in studying point of view, argument, and text structure across multiple texts. Although Chris recommends Close Reading for grades 5-8, I believe this gives evidence of how the strategy can be used with younger students as well. We can use Close Reading with poetry as we think about the author's choice of words and use of rhythm and rhyme, with class read alouds or youtube showings of a story, and with songs...even in kindergarten. You see, kinders love to talk too, and they can be very observant. If you decide to wear one red sock and one blue, I would place a strong bet that you wouldn't make it through the day without your kinders telling you. Why not tap into those observation skills with our texts too. Keep instruction clear with a purpose, engaging and active, so that the strategy is transferred to other texts. ✅Set the purpose for the reading. ✅Assign sections of the text to read and share your expectations for marking it. ✅Give time to read and a stopping point for discussion. Having kids turn and talk about the section may flush out confusions they may have. ✅Set a new purpose for the reading. ✅Again, read and interact with the text in sections. ✅Set a new purpose for the last reading. ✅With a third reading, students must be using high level thinking which requires them to analyze the ideas included in the text for the purpose. ✅The information learned from the reading is used in an extended response. 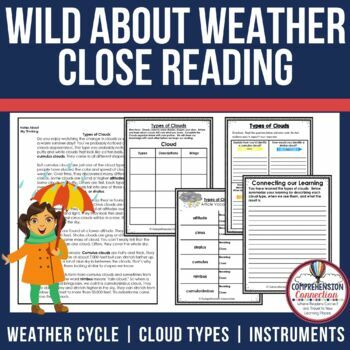 In working with a group of fourth graders this week who hadn't used close reading much, I decided to begin with an anchor chart that walked through the process as we worked with a weather close reading set in one of my resources. Of course, it was new to them, and because they really hadn't been taught to interact with the text in this way, there were a fair number of groans. However, they all expressed an understanding of how this would help them in future research projects, reading of complex materials, and with testing. Close reading would not be something to do every single day, but I think it definitely helps kids rethink their thinking about their reading. For practice, there are certainly lots of wonderful free resources to get you started. If you [CLICK HERE], you will be taken to a list of free close reading sets. 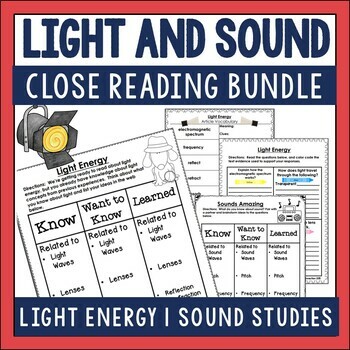 You can find close reading resource sets for all grade levels now too. I hope you'll give them a try and see the benefits as we have at my school.